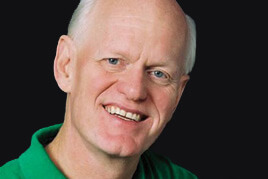 Marshall is a bestselling author, world-renowned speaker, an international business coach and consultant, and a long-standing patient of Dr. Briscoe. Because he is a public speaker, Marshall's picture is everywhere. He wanted a great smile, one that would enhance his appearance, without overwhelming it, one that would be timeless and endure and one that would compliment his style and not conflict with it. He thinks that Dr. Briscoe gave him just the right smile. And we agree. "I do three things for a living. One is that I write and edit books and articles. I am the author of three Wall Street Journal best sellers. Number two is that I coach executives. My clients are CEOs or could be CEOs of huge companies. I also give a lot of keynote speeches. "Often huge pictures of my face are posted wherever I am speaking, so my smile and how my smile looks is very important.